A TEENAGER has been charged with animal cruelty and trespassing after jumping the fence and harassing animals at Bundaberg's Alexandra Park Zoo. Police were alerted to the incident yesterday after a video was posted to social media showing a boy scaling a fence and entering an enclosure containing multiple animals, while a second juvenile filmed the offence. Bundaberg Police Senior Constable Darlene Webb said the alleged offence took place at the zoo on Quay St at 5.40pm on Saturday, March 16. 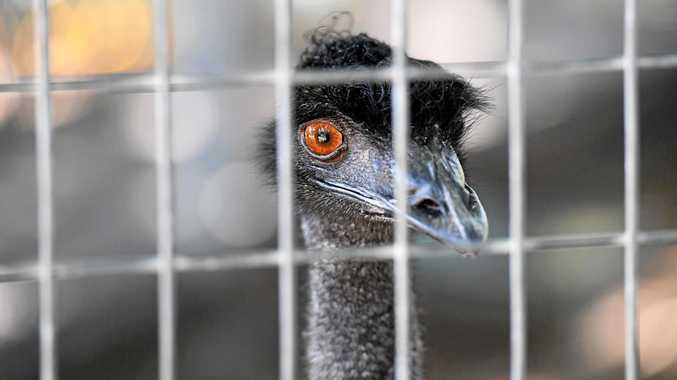 "The 15-year-old has waved his hat at an emu causing the animal to become aggressive and charged at him. He has then thrown a rock at the emu," she said. Police said CCTV footage has revealed the teenager also threw a handful of bark and slapped at a wallaby, which also charged at him in defence. "The animals were distressed by the attack, however they were not physically harmed," Sen Const Webb said. Police will question a 16-year-old boy believed to have filmed the incident.